So far we have had a quartet of posts from the California trip in March. 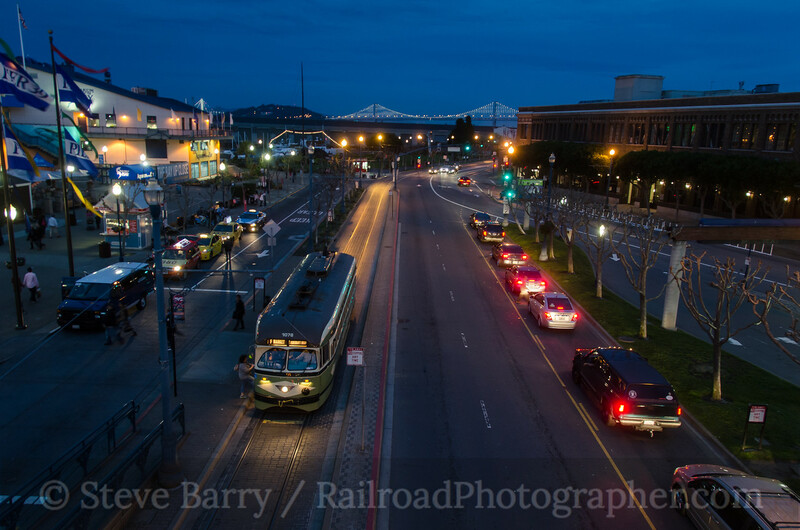 We visited the bridges of downtown Los Angeles, spent an evening watching trains at Commerce, visited Merle Haggard's boyhood home of a converted refrigerator car, and watched dusk turn to night on The Embarcadero. In this, our final installment on the trip, we visit Niles Canyon, located just east of Fremont. 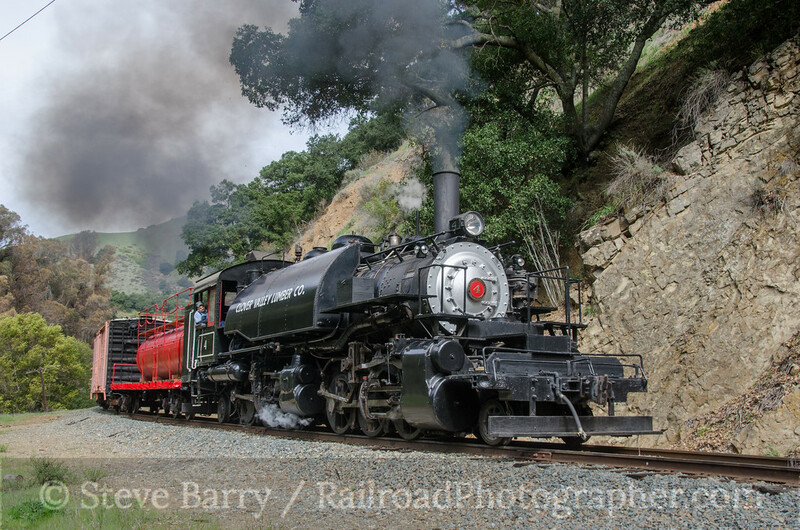 On the day after Winterail, the Niles Canyon Railway hosted its annual photographers' trip. 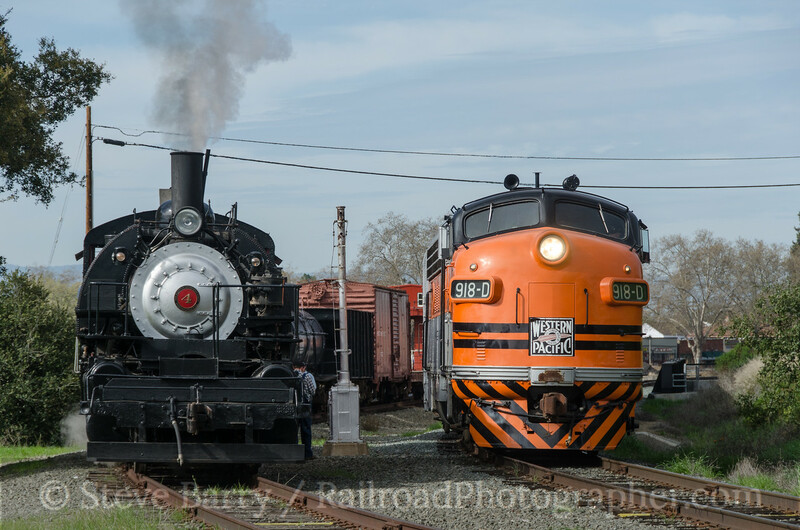 The stars of the show were Clover Valley Lumber 2-6-6-2T No. 4 and Western Pacific F7 No. 918-D (above). The steam locomotive (which powered a freight train) was built by the Baldwin Locomotive Works in March 1924. The F-unit was built by the Electro-Motive Division of General Motors in January 1950. 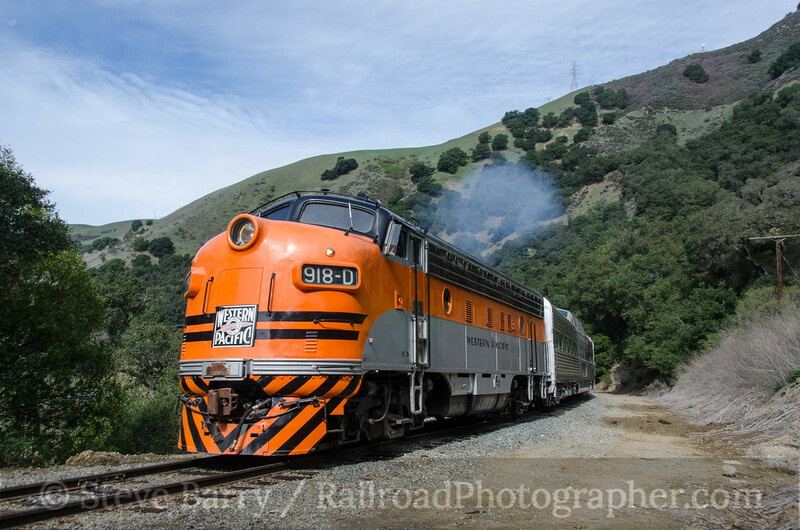 While both locomotives are now working in Niles Canyon, they spent some (if not most) of their working lives further north in California in the Feather River Canyon. The first set of photo runbys were held at Niles Junction right on the edge of Fremont. No. 4 made for a fine sight as it pulled its freight train. Moving further east into the canyon, No. 4 put out some smoke for the assembled photographers. Not to be outdone, No. 918-D also put a wisp of diesel exhaust into the air. 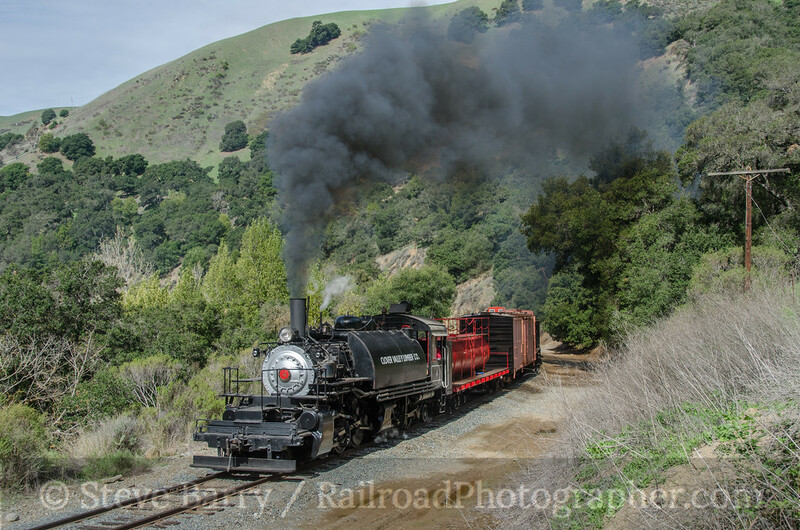 One more set of runbys was held as the two trains made their way back to the starting point of the trip -- the station in Sunol. The trackage used by the trains is former Southern Pacific. The former Western Pacific (now used by Union Pacific) also shares the canyon (we'll get to that in a minute). No. 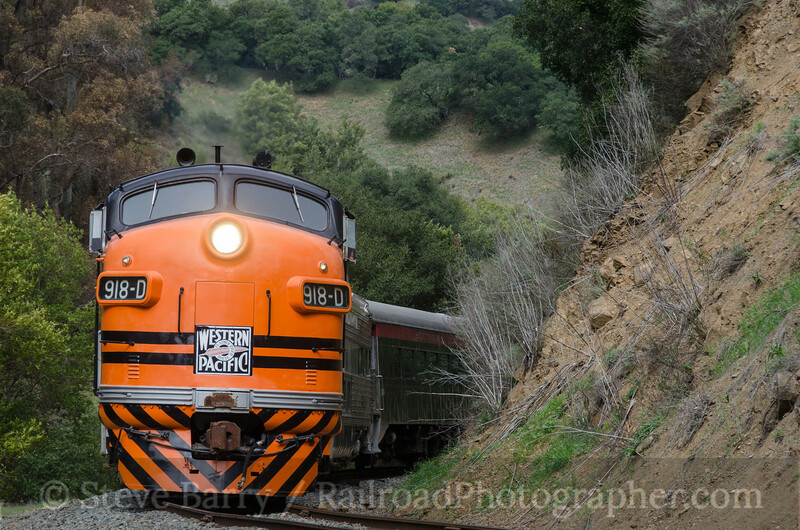 918's orange nose along with the green foliage gave a very Feather-River-Canyon-ish look to the scene. 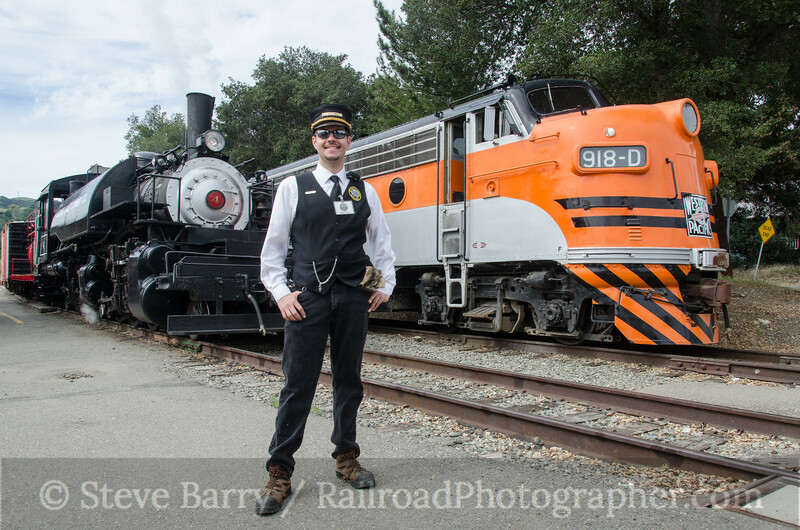 Back at Sunol, conductor Mike Roque posed for photos with the two trains. Mike coordinated the runbys under sometimes tough conditions (the riders ranged from casual photographers who wandered everywhere to serious photographers who wanted people-free shots). Mike somehow herded the cats to give everyone who wanted a quality photo the results they were seeking. 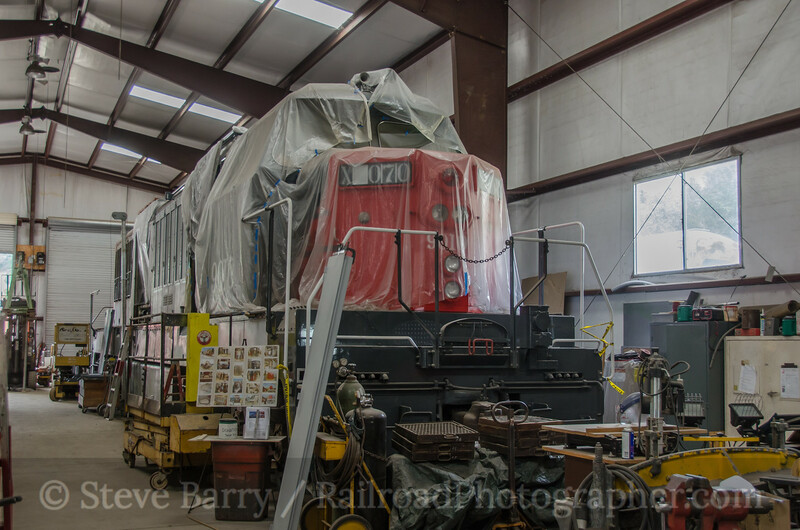 At the Niles Canyon Railway shop at Brightside (just west of Sunol) a quick peek inside revealed the restoration work on Southern Pacific No. 9010. This unit is a unique diesel-hydraulic machine imported from Germany. Only SP and the Denver & Rio Grande Western purchased them, and No. 9010 is the sole survivor. It is being returned to operating condition by the NCRy forces. 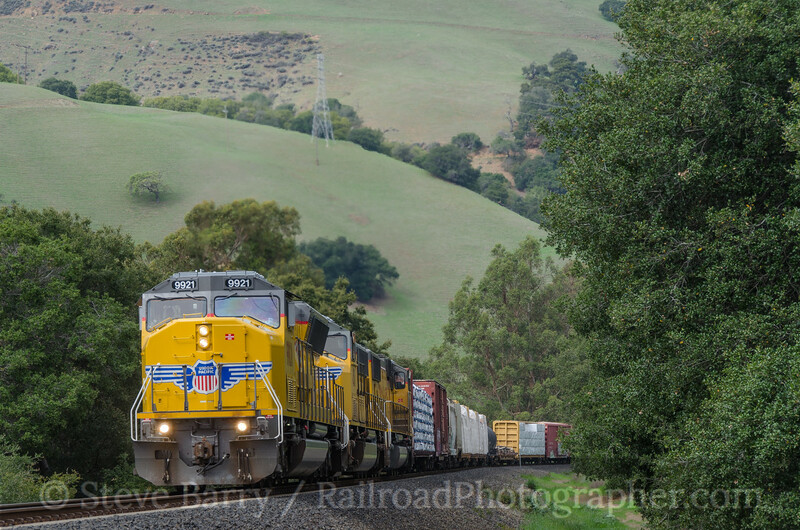 Word had come down that Union Pacific was sending a freight over the former Western Pacific through Niles Canyon. 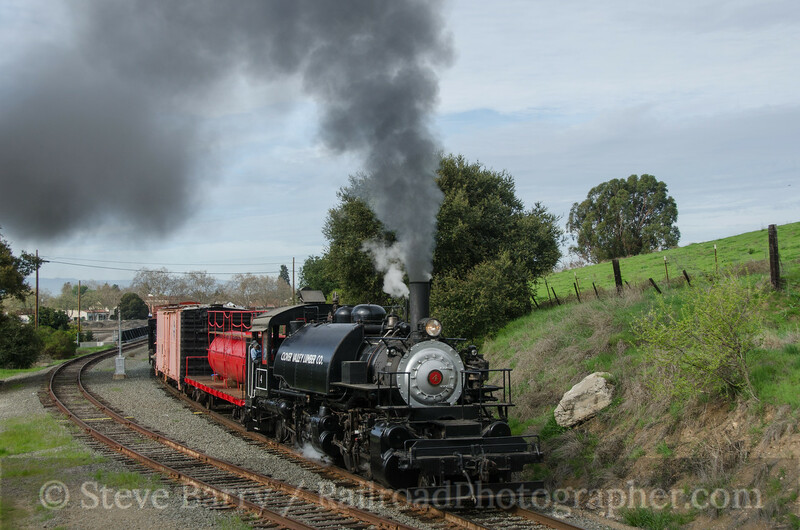 With the activities at the Niles Canyon Railway complete, I headed into Fremont to the extreme west end of Niles Canyon and shot the train there. 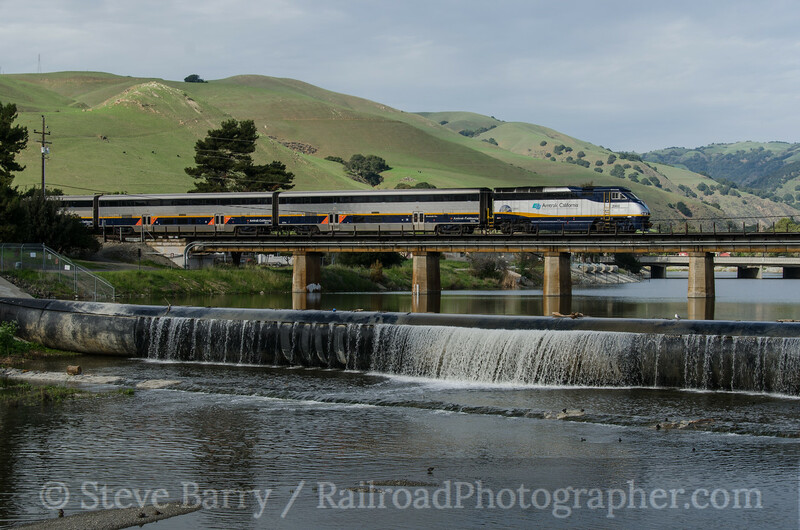 There was one more shot to get in the area, as Amtrak California sends several trains through each day. I headed to the bank of Alameda Creek and got a train approaching the site of where Niles Tower once stood. The rear of the Amtrak train is actually only a couple hundred yards away from where the top photo in this blog entry was taken. Once I was done here I headed into San Francisco for the previously-posted evening on The Embarcadero. You can see all the photos from this day here. 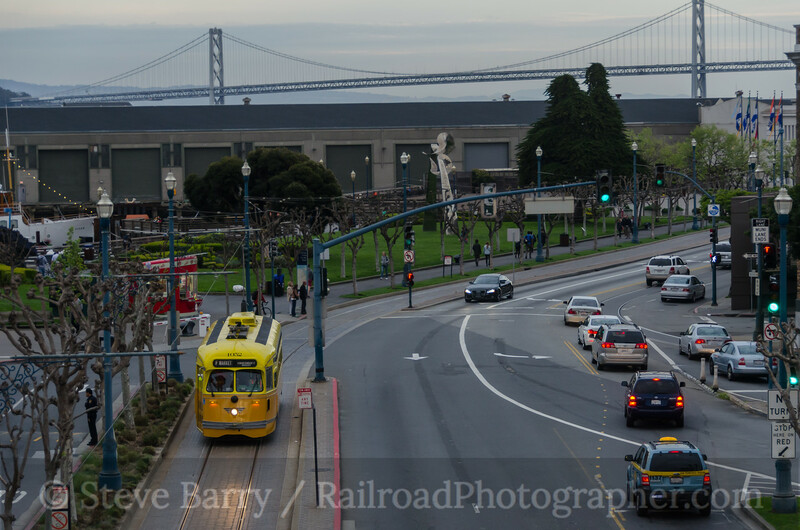 Probably my favorite street in the United States -- at least for photography -- is The Embarcadero in San Francisco. 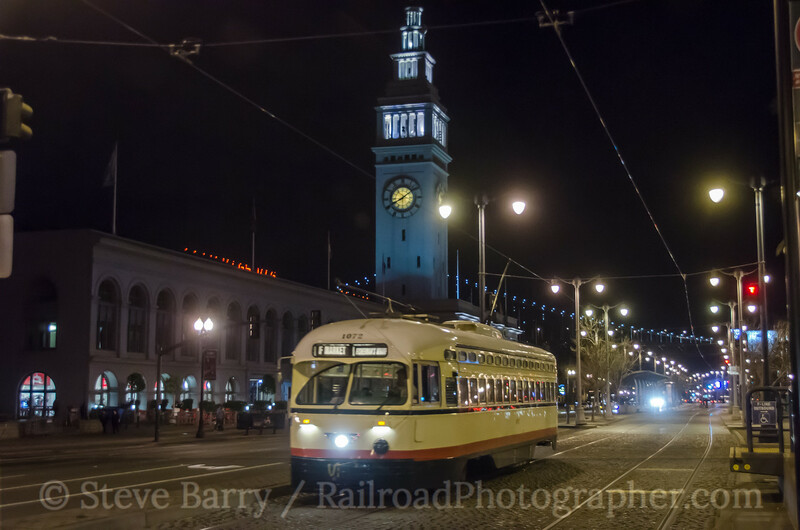 MUNI's historic F-Line operates over much of The Embarcadero from the Ferry Building at Market Street down to Fisherman's Wharf. On March 9, 2014, inspired by the MUNI photography of Christian Goepel, I spent an evening watching the changing light as darkness settled in along the bay. 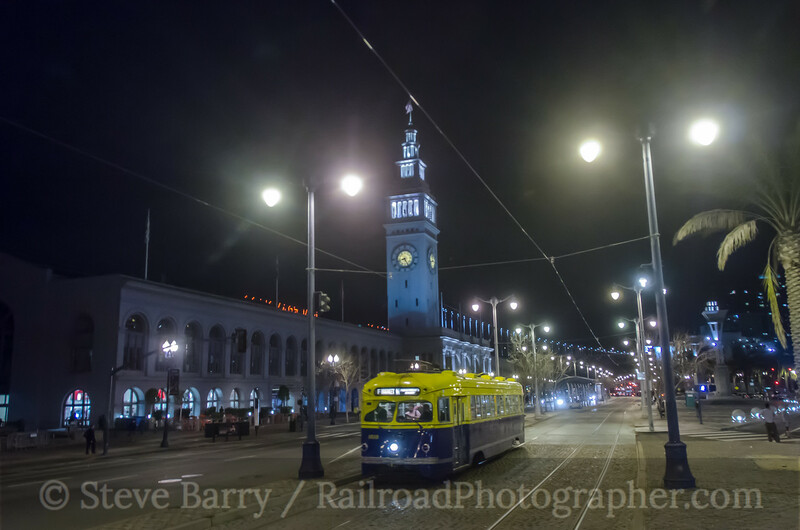 First up was MUNI PCC No. 1052, painted in the colors of the Los Angeles Railway (all the MUNI historic streetcars are painted in various schemes of streetcar routes from across the North America). It's headlight reflected off the roadway as darkness moved in (above). Up next was car No. 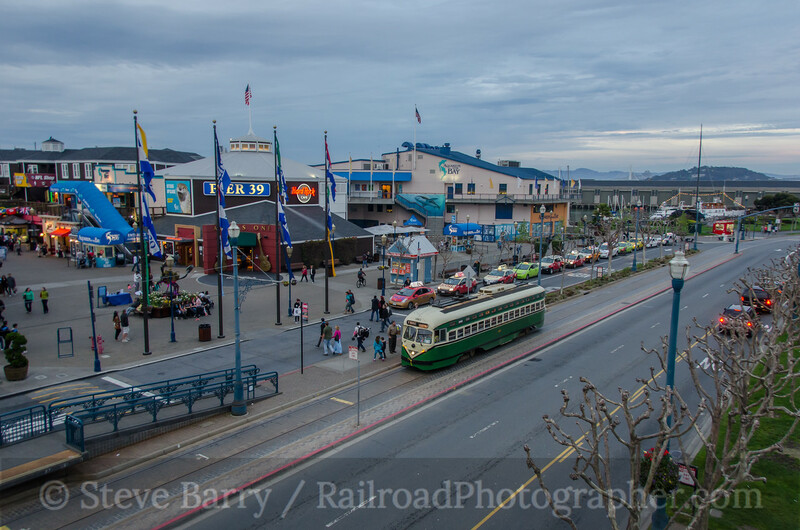 1062 representing Louisville, Kentucky, making its stop at Pier 39. Car No. 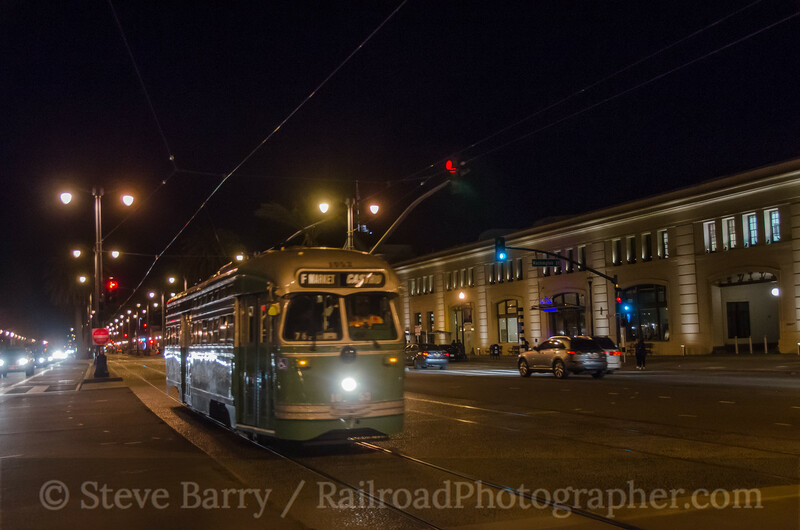 1052 made its two left turns at Fisherman's Wharf and headed back east one block over from The Embarcadero. It was just about fully dark by the time car No. 1078 (painted for San Diego) appeared. The lights of the Bay Bridge appear in the background. Finishing off the dusk-to-dark parade was car No. 1075, wearing colors from Cleveland. 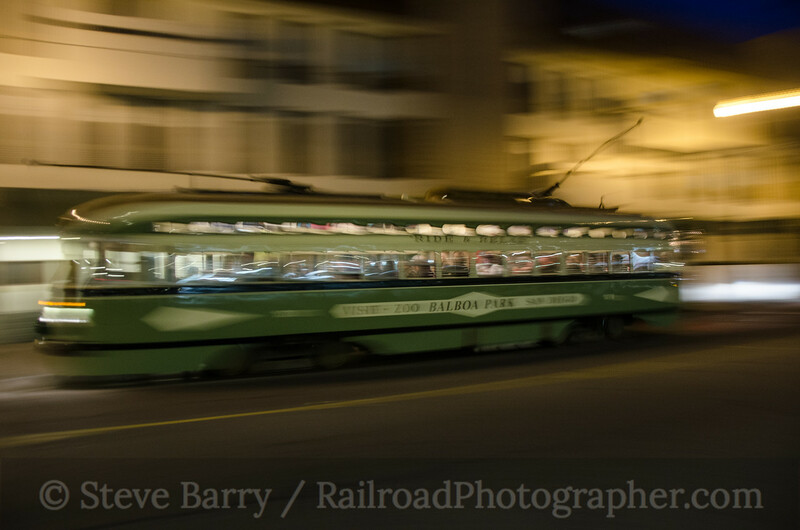 As I went to change locations I encountered the San Diego car (1078) returning from Fisherman's Wharf so I decided to try a pan shot as it went by. From here I went up to the Ferry Building near the intersection of The Embarcadero and Market Street. 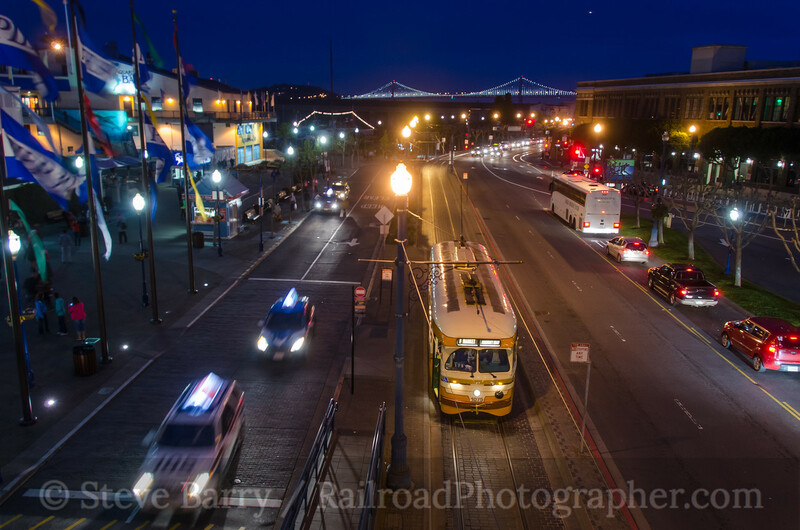 This is one of the best intersections for shooting transit in the country, as you also have the famous cable cars just a block away. The first car I caught at the Ferry Building was No. 1072, painted for Mexico City! Turning around, car No. 1053 was making its return from Fisherman's Wharf. It is painted for the street railways of Brooklyn, New York. We finish the night with car No. 1010, painted for the hometown San Francisco Municipal Railway. 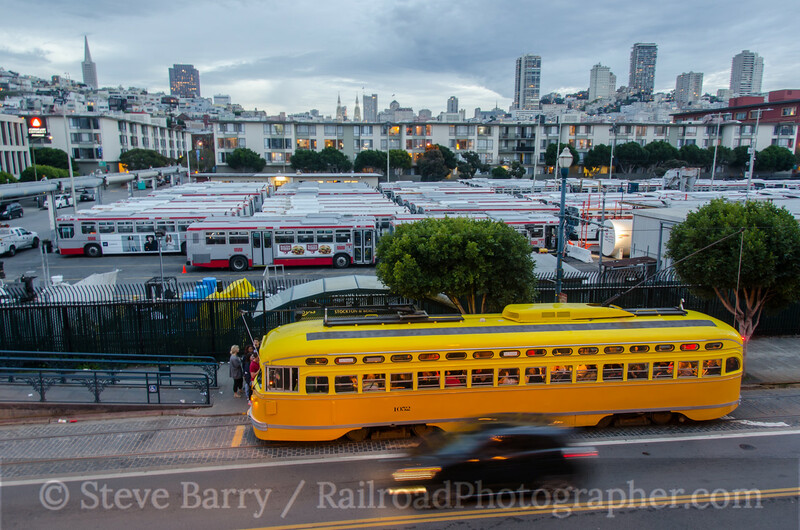 It is also the only native San Francisco car photographed on this evening -- all the rest came to San Francisco from Philadelphia or Newark. No. 1010 made a fitting end to an interesting evening. All the historic MUNI streetcars are equipped with GPS, so you can see which cars are where at any given time by looking at the map here. And you can find more photos from this evening (as well as stuff from Niles Canyon that I shot earlier in the day) in the gallery here. Not only is Merle Haggard proud to be an Okie From Muskogee, but he's also a proud railfan and model railroader. A lot of that was influenced by where he grew up along the Santa Fe tracks in Oildale, Calif., on the fringes of Bakersfield. The line that is still used by oil tank trains passed within a few feet of the Haggard home, and its influence can be heard in the song "Oil Tanker Train" on Merle's latest album Working In Tennessee. In that song, Merle relates the joy he felt when his father bought him a model oil train for Christmas. 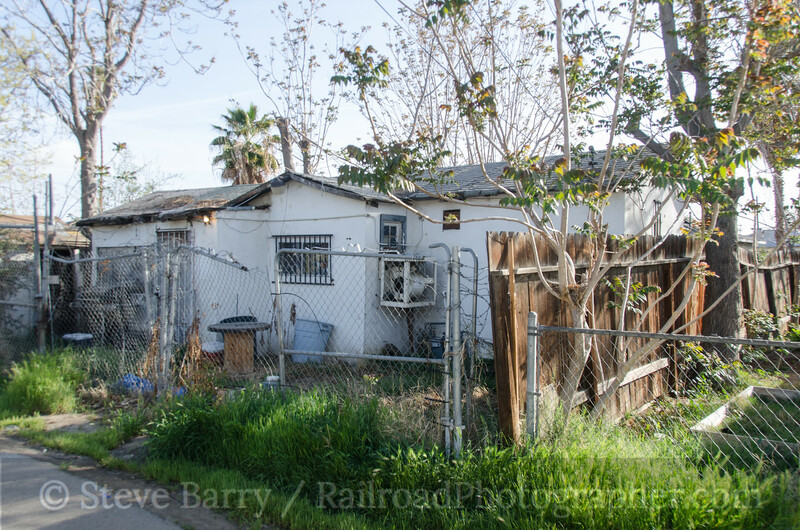 Not only did Haggard live near the tracks, but his house was actually a converted refrigerator car that his father, James, rebuilt into a house during the depression. He added a pop-out dining area and other modifications have been made throughout the years. Today, the house sits under a tangle of vines, although still occupied. A timely article in the New York Times on February 24, 2014, documented the history of Hag's home, coming out just before I headed west to California for Winterail. Since I was heading from Los Angeles up to Stockton via the Central Valley, a stop in Oildale became a priority. While the Times article didn't give the exact location of the house, an internet search did give an approximate intersection, and using that and the tracks as a guide (along with a photo in the Times article) I soon found the house. You really have to look to see the refrigerator car -- its the lengthwise section parallel to the street. A front entrance has been added, somewhat masking the car. Being a country music lover (Cash, Willie, Jones, Hag and Waylon) this was indeed a highlight of my trip.